"Healing is not the 'how' or 'why' - nor is it a recipe. It is a state of being. ; Love becomes it. It becomes love. --- And it is the healer." Reiki (pronounced ray-key) is said to eminate from divine source, regulated by divine intelligence, and it is this universal intelligence of life-force energy which knows infinitely more than our conscious ego selves, and how to work. This Japanese word is derived from rei meaning "free passage" or "Higher Intelligence," and Ki, meaning "life force energy." 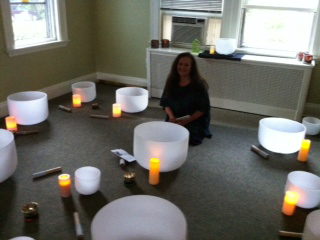 Reiki is both a path to awareness and openness to the divine, but also a path for healing and wholeness. It represents a form of spiritual healing that involves the transfer of universal life energy from the practitioner to the recipient. By opening a path to one's spiritual source, the energy in your body is corrected and adjusted to a healthy state. In order for Reiki healing energies to have lasting results, the client must accept responsibility for his or her healing and take part in it. A sense of peace and well-being enables you to make healthy changes in your life. Reiki is administered by "laying on hands" and uses specific techniques for restoring and balancing the natural life force energy within the body. When a life force energy is low or out of balance, a person is susceptible to sickness and/or stress; if a life energy force is high, a person is apt to be happy and healthy. While most western medicine focuses on the symptoms of disease, or the effects of energetic imbalances, energy healing addresses the root causes, going directly to what is creating the disease, stress and discomfort. Therefore, Reiki harmonizes on all levels: body, mind and spirit. Reiki addresses the whole person, encouraging the release of all tension, stress, panic-attacks, negative-thinking, repressed negative thoughts, sadness, depression, fear, anger and anxiety, effectively restoring emotional balance, peace and vitality. Reiki also provides effective pain relief from acute conditions, although relief from some chronic conditions may take longer. Any time a condition becomes chronic, the entire body is involved in the healing process on all levels. Treatments may be given sitting in a chair or lying on a table, while the client remains fully clothed. 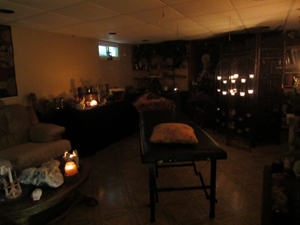 Treatments often feel like a wonderful loving, glowing radiance that flows through and around the client. What one experiences from a Reiki treatment can vary from person to person, but whatever the experience, at it's simplest level, deep relaxation is usually felt by all, leaving one feeling refreshed, feeling lighter, and having a more positive balanced outlook on life. Reiki is the energy of love. Reiki is unconditional love, healing and acceptance. Reiki is seeing the divine in all. Reiki may enhance your own personal beliefs. And while the Reiki ideals are similar to the golden rule, and the concept of loving/honoring thy neighbor as thyself, Reiki is *not* a religion. It merely holds to the universal ideals that promote peace and harmony in ourselves, with others and with mother earth. 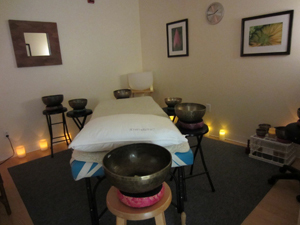 Reiki is healing that is restorative balance and good health. Sound vibration is the primary mover for change, effectively shifting an individuals vibrational level back to a less chaotic and natural rhythm. Brainwave patterns affect your mental and emotional health and consciousness. These bowls affect the brainwaves, allowing the patient to comfortably, easily and quickly slip deeply into states of theta and delta. Bowls have long been shown to lower blood pressure and heart rate by inducing alpha waves in the brain. Once the optimal mental./brainwave state for maximum potential has been achieved, then all external blocks are eliminated and our highest healing potentials are reached by re-engaging our mind-body connection. At this level, healing on all levels occur, creating a more balanced and strengthened Immune System, release of pain, release of stress thereby creating a sense of well-being feelings of vitality, happiness, confidence along with more energy and clarity of thought. Balance is the key to the Bowls' power. 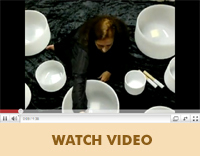 Priscilla works in a true partnership with the bowls. Our bodies are largely comprised of water and crystal, water being liquid crystal. Both water and crystal vibrationally respond to frequencies. All living cells from humans, animals and plants give off invisible energies. Specialized groups of cells create more organized energy patterns. Therefore, energy is not only pattern, it is vibration and it has structure. A healthy human being is not just a physical state. We have more than just one body,, we are comprised of subtle energy bodies; physical, emotional, mental and spiritual bodies. In a healthy human being all these energy bodies flow harmoniously and freely. When physical and emotional health problems occur, the balances and flow of the energy has been disrupted, leading to problems and dis-ease in the body. Often injury or illness is the result of an imbalance that has first occured in an energy body, prior to manifesting in the physical body. Fear, pain, anger, negative thoughts and unresolved feelings create blocks that then manifest as illness. Quantum physics describes the universe as energy, with energy and matter being interchangeable. The aura can viewed as an energy field that surrounds, penetrates and extends beyond the physical body, that is electromagnetic, eminating live and intelligent vibrations and frequencies. It is often referred to as the Etheric body. While human consciousness is manifested throughout the 7 layers of the auric field, and the 7 main chakras while having their origin in the physical body, also exist in all layers of the aura, the speed and vibrational level of the energy is increased with each level beyond the body. Chakra is a Sanskrit word that means "wheel." A chakras spins in relation to the energy level of our physcial body and subtile energetic bodies. Each Chakra resonates to a specific musical note., which corresponds to specific functions and areas with the human body as well as throughout all layers of the auric field. Everything in and around our bodies resonates to sound. We all hold within our bones, blood, organs, emotional and etheric bodies, the harmonious vibrational memory that is the organizational patterning for perfect health. Our body's intelligence knows and remembers perfect health. 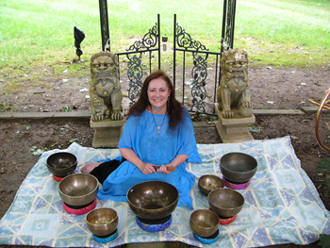 Each specific musical tone and vibration of the bowls awakens and stimulates the chakras, organs, tissues, bones and cells of the body to remember this patterning for perfect health, thus allowing the body come into full alignment, to promote healing on all levels.